These clubs are affiliated to the NZBAI, by joining a local club, you become a member of the Association.Click a club name on the map for its contact details. 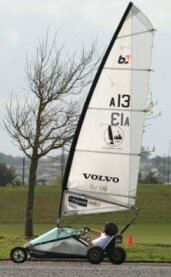 You can tell a club kart from the letter on its sail.The clubs are not just about racing. Many have social events and non-racedays as well. So join a club today to join the “blokart family”. Please note some clubs are incorporated and some of the newer ones are not. Clubs issue sail numbers to members that includes letters to identify the club. blokart Club members are a friendly bunch so if you see us out and about, feel free to come on over and introduce yourself. Please join your nearest club. They can then put in contact with others near you.